Please click on the tab of your child's school: Upper, Middle, or Lower. Summer Letter from Head of School: This important letter was sent home the week of July 18. Rising grade 9 students and new Upper School students receive laptop training to get accustomed to their new devices. Please sign up here. If you cannot make these dates, please email Mr. Jason Rosenberg at jrosenberg@stoneridgeschool.org. New Parent Reception for Upper School Parents, Wednesday, August 23, 6:30-8:30 pm, Head of School Residence. RSVP here. Stone Ridge offers half-hour, weekly lessons after school here on campus. Lessons are offered on piano, guitar, woodwinds, brass and voice. Group guitar classes are also available in weekly 45-minute classes. More detailed information will be sent out in August. Contact Jamie Golembiewski . Silver Strings Suzuki Studio has limited openings for the 2017-2018 academic year. If you are considering enrolling your child in the studio program (ages 5 and up) please contact Elizabeth Cunha soon to inquire about scheduling availability. Student Parking: Third and Fourth Academic students will need to register their car for on campus parking. Read the letter and fill out the form. Upper School Uniform Requirements - visit our uniform web page. The Gator Gallery will resumes normal Tuesday and Thursday operations August 29. The Gator Gallery is available 24/7 through our online ordering system. Health Forms - all athletes must complete a health form by July 31, and the consent for the Concussion ImPACT testing. Gator Strong Summer program, June 1-July 31. Learn more and register. TENNIS: For summer tennis lesson or camp recommendations please contact Coach Bob Finney or Coach Larry Zebrak. Health Forms - visit www.stoneridgeschool.org/health to access the appropriate health forms. Health Forms are due to Alana Pitcher, RN by July 31. Concussion Testing - Please read the ImPACT Letter and fill out the online ImPACT Consent Form (Immediate Post-concussion Assessment and Cognitive Testing) by August 18. The Upper School Office will be closed July 31 through August 11, and will reopen on Monday, August 14. If you need assistance, please email usoffice@stoneridgeschool.org, which will be checked periodically. Students may purchase textbooks through MBS Direct at http://bookstore.mbsdirect.net/stoneridge.htm, or from another source (ex: amazon textbooks). MBS Direct's virtual bookstore will open July 3. Book list for 2017-2018 (updated July 27). Students will be mailed a list of their courses in early July. If you have questions, please contact the Assistant Head of Upper School Malcolm McCluskey. To sign up for a session please visit www.freedspirit.com. Click on the calendar and register with your contact information. Select "Stone Ridge Senior Portraits" and sign up for your preferred date & time. Portraits will be taken in the Large Parlor in Hamilton House and outside. Dress for senior portraits is "nice dress" as defined in our handbook. There is no charge for the portrait session. Pictures taken will be available for purchase directly from Freed Photography and you will be able to view all of your pictures in an online gallery. Portrait sessions are optional. 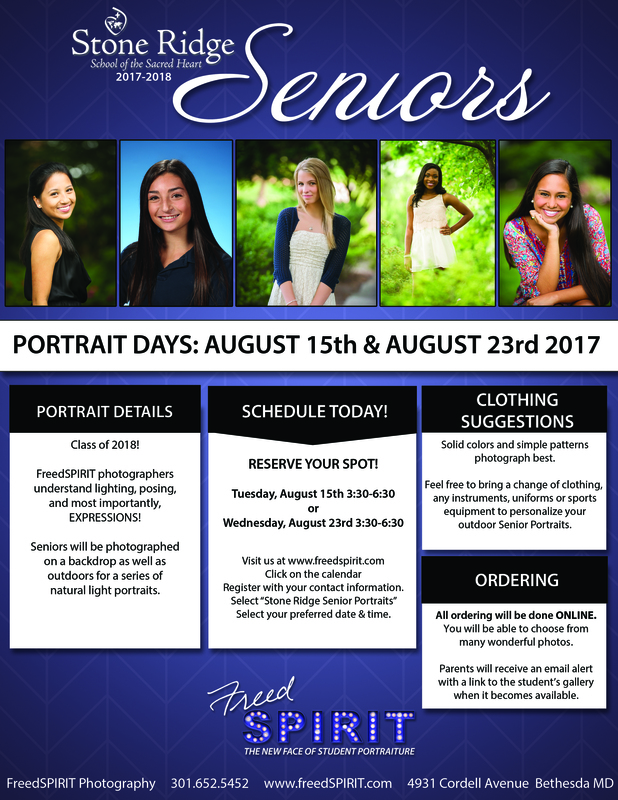 However, if you do not schedule a senior portrait session with Freed Photography, you will need to have your picture taken at school on August 30, in uniform. Here is the Freed Photography flyer. #SRSummer - Keep SR Social Media and website news active over the summer! Use the hashtag! Send any photos of your child in SR gear on vacation, playing at the pool, having a picnic, etc. Include first name, graduation year, and location. Send information about accomplishments over the summer. Did you go to a cool camp, win a competition, make an all-star team, perform in a summer play? Include name, graduation year and accomplishment. Email to E-Communications Manager Patty Lynch. EN200 British Literature Please refer to the attached document. Link to example of Commonplace books. EN231 Honors British Literature Please refer to the attached document. EN300 American Literature Please refer to the attached document. 4th Academic English Electives Please refer to the attached document. EN530 Journalism Please refer to the attached document. FL120 French II Please refer to the attached document. Honors French Literature Please refer to the attached document. FL220 Spanish II Please refer to the attached document. FL230 Spanish III Please refer to the attached document. FL260 AP Spanish Language Please refer to the attached document. FL270 AP Spanish Literature Please refer to the attached document. FL340 AP Latin Please refer to the attached document. HS530 AP US History Please refer to the attached document. Accessing IXL.com for math and language arts practice over the summer. Students who have been using IXL.com during this past year will log on the same way she has in the past. Anyone can use a computer to access ixl.com and have the math and language arts modules available. You can now browse both the math and language arts sections and click on activities you’d like to practice. You can also click on the ‘Help Center’ link at the bottom of most ixl.com pages. The Grade 5 lockers are made of a plastic composite material without metal, therefore the students cannot use magnets. Students may purchase a magnetic strip that will hold magnets. Regular tape and command strips for hooks may be used. The locker dimensions for Grade 5 are: 10"W x 16"D x 13"H.
The Grade 6-8 lockers are made of metal so you may use magnets. The dimensions for Grades 6-8 are: 14"W x 16"D x 32"H.
Please do not purchase materials to decorate the outside of the locker door, with the exception on and around a student's birthday. Please do not purchase anything for your locker that would deface the interior or exterior surface. Mrs. Maryann Will, Middle School Learning Specialist, will conduct the classes. Visit www.stoneridgeschool.org/studyskills to learn more. The workshop is full. The Middle School is excited to offer the optional service of SchoolKidz Supply Kits for the purchasing of grade-level supplies. Ordering is now open through June 23. Information and ordering instructions can be found here. Your daughter’s school supplies box would be delivered to your daughter’s advisor on the first day of school. Please free to contact the Middle School Office with any questions. We strongly suggest that all Middle School students have a library card to your local library. Middle School Uniform Requirements - visit our uniform web page. Health Forms - Please visit www.stoneridgeschool.org/health to access the appropriate health forms. Health Forms are due to Alana Pitcher, RN by July 31. In early September, Grades 6-8 students will take a non-invasive test for concussions on the computer measuring memory, reaction time, processing speed, and impulse control through a series of tasks. New Parent Reception for Lower and Middle School parents, Thursday, August 24, 6:30-8:30 pm, Head of School's Residence. RSVP here. Musical Auditions, September 6 and 7, 3:30-5:00, and callbacks will be September 8, 3:30-5:00. Stone Ridge offers half-hour, weekly lessons after school here on campus. Lessons are offered on piano, guitar, woodwinds, brass and voice. Group guitar classes are also available in weekly 45-minute classes. More detailed information will be sent out in August. Questions, please contact Jamie Golembiewski. The students may purchase textbooks through MBS Direct at http://bookstore.mbsdirect.net/stoneridge.htm, or from another source (ex: amazon textbooks). Book list for the 2017-2018 school year. Note: Grade 5 and 6 English Workbook: Strategies to Achieve Reading Success (STARS) - This workbook must be ordered (new condition only) from the publisher. ISBN: 978-0-7609-6368-5. Please use the exact ISBN number to ensure the correct edition is ordered. All Grade 5 and new Grade 6-8 students will receive laptop training to get accustomed to their new devices. Please sign up for one training session. Please note both student and parent/guardian must attend the session. The parent and child session is the first half an hour and the second hour is for students. #SRSummer - Keep SR Social Media and website news active over the summer! If you need assistance, please email msoffice@stoneridgeschool.org. This email will be monitored periodically over the summer. For returning students, the login process should be a familiar one as IXL was used throughout the school year. Click on Math at the top of the page and navigate to the appropriate grade level. Select a skill to practice. For returning students, the login process should be a familiar one as Dreambox was used throughout the 2015-2016 school year. The Lower School Office will close June 16 and reopen on August 14, 2017. If you need assistance, please email lsoffice@stoneridgeschool.org. This email will be monitored periodically over the summer. Each Preschool, Pre-Kindergarten, and Kindergarten child will receive a Little Hearts Stone Ridge backpack. You do not need to buy a backpack for your child. It is required to bring this backpack to and from school each day. School Supplies for the School Year 2017-2018 (Kindergarten- Grade 4) will be provided for each student. We will NOT be using Schoolkidz this year. We will be sending a letter home with all of the information needed for each grade over the summer. Lower School Uniform Requirements - visit our uniform web page. The Gator Gallery will resume normal Tuesday and Thursday operations August 29. Summer is a great time of year to play outside, get lost in a book, pick up a hobby, and learn something interesting! We highly recommend that your daughters spend no more than 1-2 hours (less is better!) on any device including their school owned laptops, cell phones, and television. We also recommend that students should not take their school owned devices on trips or camps. Consider trying out Common Sense Media's newest challenge: Device Free Dinner. What age should my child have a cell phone? We recommend and believe that a child below Grade 9 does not need a smartphone. If you do need your child to text or call you, we recommend purchasing them a flip phone. Are you looking for some guidelines on managing technology at home?